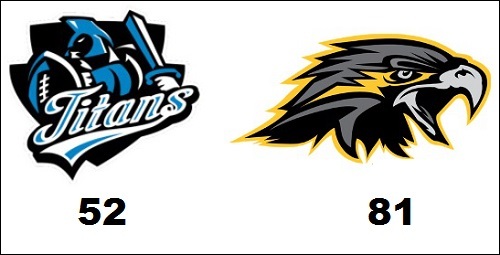 WICHITA FALLS, TX - The Wichita Falls Nighthawks used a 35-point second quarter surge to overtake the Cedar Rapids Titans en route to an 81-52 win. The Titans, who came into the game at 1-6, scored on the opening kickoff when Phillip Barnett returned the kick 46 yards for the score. The Titans actually led 20-14 at the end of the opening quarter. Then came the onslaught as the Nighthawks scored four straight touchdowns to take a 42-20 lead. After the teams traded touchdowns, the Nighthawks had a 55-28 advantage at the break. Wichita Falls had 30 first downs to Cedar Rapids' 17, and the Nighthawks had a 279 to 215 advantage in total yards. There were 27 total penalties in the game, 16 flags for 115 yards by the Titans and 11 for 64 yards by the Nighthawks. The Nighthawks' 81 points is the highest point total in the IFL this season. For the Nighthawks, Charles McCullum completed 23 of 32 passes for 219 yards, nine touchdowns and an interceptions. He rushed five times for 41 yards and a touchdown. Tyler Williams rushed for 17 yards and a touchdowns. Jordan Jolly had eight catches for 96 yards and a score, while Barnett had five catches for 50 yards and a score. Troy Evans caught three passes for 24 yards and two touchdowns. Michael Carter had two interceptions, and Josh Francis and Malcolm each recorded a sack. Brion Carnes completed 11 of 18 passes for 152 yards and four touchdowns and two picks. Marcus Bennett replaced him and completed two of his four passes for 17 yards. Both of his completions went for touchdowns, and he tossed an interception. Barnett rushed three times for 39 yards. Dramond Powell had a game-high 124 yards on six receptions for three touchdowns and Conner Hollenbeck caught three passes for 26 yards and three touchdowns of his own. Tony Grimes led the titans in total tackles with 7.5 and had an interception. Robert Haynes recorded a sack. The Nighthawks (7-1) visit the Colorado Crush (1-6) on April 21 with a 5 p.m. (pacific) kickoff. The Titans (1-7) will host the Iowa Barnstormers (5-2) on April 22 (pacific) for a 5:05 p.m. (pacific) kickoff. Both of those games, as well as all of the leagues games this season are available for streaming on the IFL's Youtube channel.